2015 Safety Seminar Schedule & Door Prizes Announced | Wipaire, Inc.
We are pleased to have announced the schedule and topics for the grand opening event at the Leesburg, Florida facility. 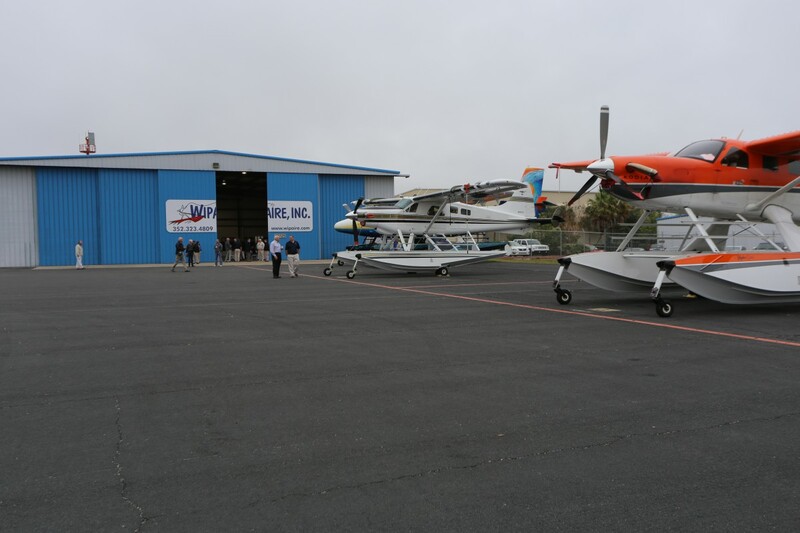 “Wipaire offers products and services to a variety of aircraft, both landplanes and floatplanes. Our seminar topics reflect this, and offer something for all pilots,” commented Chuck Wiplinger, President and COO. Event check-in will start at 8:30 am, with a continental breakfast available. Chuck Wiplinger will kick off the event with a brief address at 9:00 am, and Brittnie Brink, aircraft sales representative, will follow to introduce the new Boss 182. The first Wings seminar will be presented at 9:10 by Brian Addis, Senior Flight Instructor with Lake & Air, and recognized seaplane training expert. With over 32,000 flight hours, Brian is an ATP with five type ratings, as well as a CFII. His background includes working as a Designated Pilot Examiner, airline training manager, corporate pilot, college instructor, and, of course, flight instructor. Brian holds bachelor’s degrees in psychology and education and is completing his doctorate in human factors. Brian is well-known in Minnesota and surrounding areas for his safety presentations and brings an understanding of pilot psychology to his seminars. He will be speaking on the unique nature of seaplane operations and seaplane task management. This seminar will explore the difference between seaplanes and how seaplane operations are different from landplanes in operation and philosophy, as well as correlating an understanding of these differences to improved landplane pilot skills. The next speaker will be Vidar “Ice” Einareson, one of Wipaire’s A&P mechanics in Leesburg, Florida. An Iceland native, Ice studied at Embry-Riddle and served as a professor following graduation. His maintenance experience includes time as a Director of Maintenance for several organizations, in addition to extensive rotorcraft knowledge. Ice will be speaking at 10:35 on float maintenance for pilots and will address basic float maintenance tasks and things to watch for on a preflight inspection. A catered lunch will be served following Ice’s presentation. Steve McCaughey, executive director of the Seaplane Pilots Association, will speak on emergency safety gear at 12:30. “Don’t Leave Home Without It” is a hands-on safety gear workshop to show pilots of both landplanes and floatplanes how to build a flying emergency kit. Steve draws from his experience as a former United States Air Force Special Operations member, backcountry pilot, and seaplane pilot. Pilots will be able to see and hold different types of emergency gear to help determine what’s best for their flying mission. Wings credit is available for Steve’s presentation. Wrapping up the seminar will be Rock Rockcastle, an ATP and active simulator instructor based in Florida. Rock has over 15,000 flying hours and is a Gold Seal Master Flight Instructor. Rock is well-known in the Leesburg area for his monthly seminars at the Leesburg International Airport, and was presented with the Wright Brothers Master Pilot Award for 50 years of safe flying. He currently teaches in the Beechcraft Baron, Cessna 300- and 400-series, and Piper Navajo at Simcom Training Center in Orlando. Rock’s presentation, “Safe Flight,” will cover items such as proper preflight procedures, spins, performance charts, and emergency operations. Rock’s seminar is eligible for Wings credit and will begin at 1:55 pm. Door prizes for those attending the seminar will include a GoPro Hero4 action camera, a custom Lake & Air seaplane jacket, a $100 Lake & Air pilot shop gift certificate, and three giveaway bags featuring limited-edition 55th anniversary items from Wipaire. All planning to attend are requested to RSVP at www.wipaire.com/grand-opening or by calling 651-414-6839. Schedules are subject to change; attendees are encouraged to arrive in advance of their seminar.